This is the third part in our project series How To Build a Solar Generator. In this part, we will be mounting all of the components into our case, as well as some of the preliminary wiring. The first thing to do is start marking the placement of the exterior components and connectors. We will use masking tape to make the initial marks, so we can adjust them if we need to without leaving permanent marks on the case. Trace around the components, to help determine placements and spacing. We will not be cutting on these marks though – most of the components have a flange to improve waterproofing and mounting. Note: If you decide to place your components in different locations than I did, you will also need to factor in where the internal components get located, where their mounting points will require holes, as well as how the wiring will route. Now carefully measure the actual size of the hole needed for each exterior component and trace out cut lines onto our case. It is better to cut slightly smaller and then file / trim the holes larger if needed. I used a vibrating multi-tool with a plunge cutting blade for the straight cuts, and a combination of drill bits / hole saws for the round holes. I also used a rotary cutting blade with a pneumatic die grinder for trimming and adjusting the holes. These tools made the job quick and easy, but are not required. Plastic is pretty easy to machine and you could achieve similar results with a sharp utility knife, a file, as well as a wide variety of other tools. Refer to the video to see me completing this step in greater detail. I will also try to add some of the dimensions of the holes you will need. Tip: Wait until the LED light fits nicely into its hole before marking and drilling the four mounting holes. After the holes are cut, test fit the LED flood light, the two switches, and the USB / 12V socket / voltage gauge pod. Once they all fit flush and snug, we will add a bead of black RTV silicone sealant around the edges of the components. The goal here is to keep our solar generator as weatherproof as possible. Give the silicone a few minutes to start to cure, and then gently place the components in their spots, one at a time. The light is secured using the socket head bolts & hardware that they came with. The combination USB plug/ 12v plug / battery gauge is held in place by the three threaded collars it came with. The two toggle switches are just pushed into their holes and rotated until they are positioned straight. The switches are supposed to stay in place with the pressure clip they have built in, but I have found in the past they tend to work themselves loose over time. Once I had them positioned how I wanted them, I added some hot glue to them inside the case for additional reinforcement. The 120v AC charging port comes with a nice quality rubber gasket to keep itself water tight, so it does not require any RTV silicone. 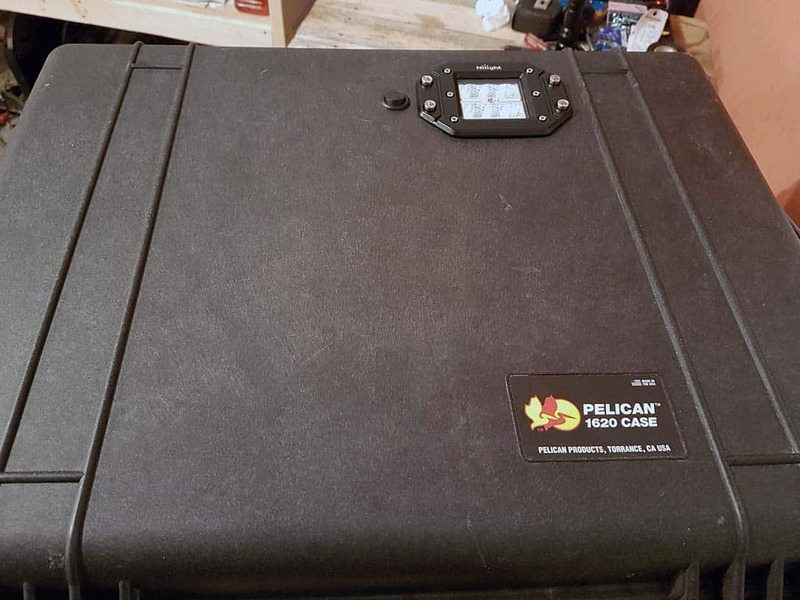 We repeat this same process for each of the components on the other side of the pelican case. The inverter remote control panel will need some RTV sealant, and it is secured using the self-tapping screws that it came with. Be careful not to over-tighten, as it will start to crush the edge of the control panel if you do. We will be using heavier #10-24 machine bolts to mount our weatherproof cover and GFCI outlet, so you can remove and discard the preinstalled mounting screws from the tabs. We will be cutting a hole just large enough for the AC outlet. Once the GFCI receptacle test fits nicely, go ahead and mark / drill the mounting holes in the metal tabs for it through the case. You may need to also widen the holes in the GFCI outlets mounting tabs and the weather proof outlet cover with the same drill bit. Don’t bolt everything together just yet! We will want to pre-wire it before installing, as it will be much easier to do this now than once it is installed. Because our inverter has a 4,000 watt peak capacity, you will want to use 12 gauge wire to our GFCI outlet. 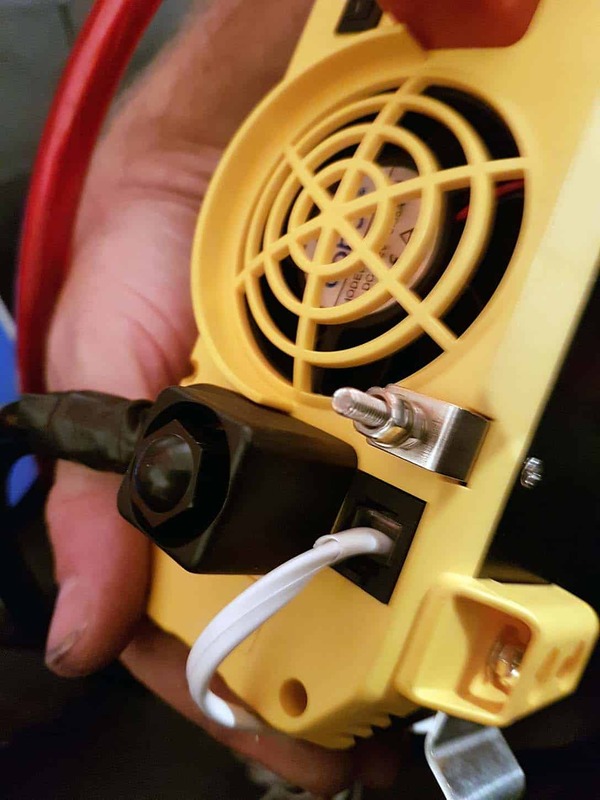 You can use standard 12-3 electrical wire, and add a standard AC 3 prong male plug to the other end for connecting to the inverter. Give yourself at least 4-5 inches of wire beyond what you need to wire into the GFCI outlet – more if you are placing your inverter in a different location than I did. I was able to make it work with the length I used in the video, but another couple of inches would have been better. Yes… I know there is a joke just begging to be said right there! Tip: I found it was just as inexpensive to purchase a heavy duty 12 gauge triple-tap cord adapter, and then simply cut the male plug end to the length I needed. When wiring the GFCI outlet, make sure you attach the ground wire (green insulated or solid copper) to the screw on the bottom edge (usually green tinted), the white wire to the screw labeled “Neutral” (usually silver colored) and the Black wire to the screw labeled “Hot” (usually brass colored). The screws on the outlet that are covered by the warning sticker will not be used for our application. 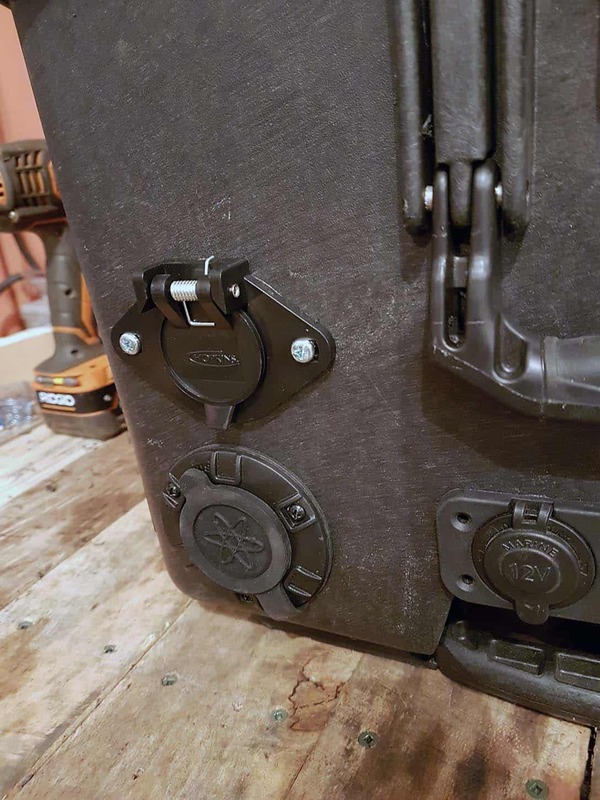 Once the GFCI outlet is wired to our electrical cord, we will then thread two #10-24 replacement bolts through the weatherproof cover, then through the outlet tabs, and into the holes in our pelican case. Secure them on the inside with a washer, spring-lock washer, and a #10-24 nut. When everything is lined up nicely, go ahead and snug these two screws up until the spring washer is compressed. Now we need to mark and mount the holes for the solar panel connection (using the 6 pin trailer connector) and the high-current 350A connector. The trailer connector is very straightforward, and I used the mounting bolts it came with. 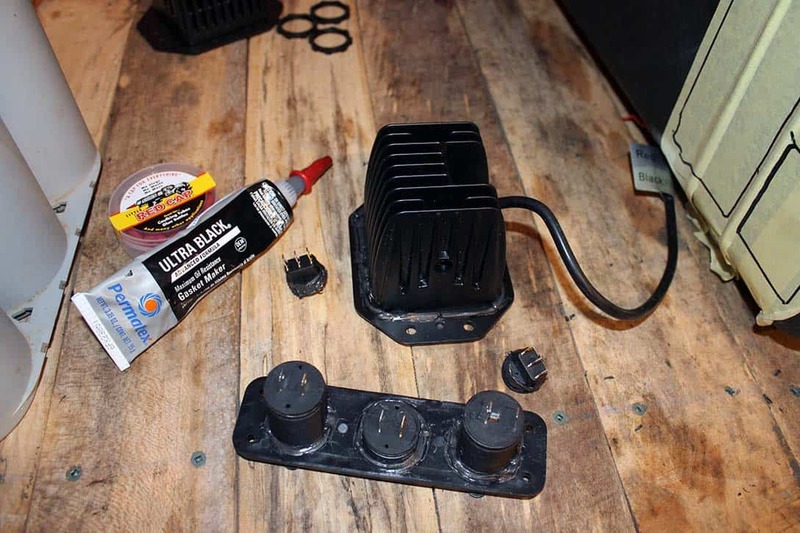 It did not have a gasket, so we add a bead of RTV sealant just like we did with the LED lights. It is easier to attach the wires now before mounting the 6 pin connector. We need to attach a pair of 14 guage wires – one red, one black. The red wire should connect to the center pin of the connector, and the black wire to the one labeled GND. Make the wires a couple feet long, so that we can shorten them to the right length later. 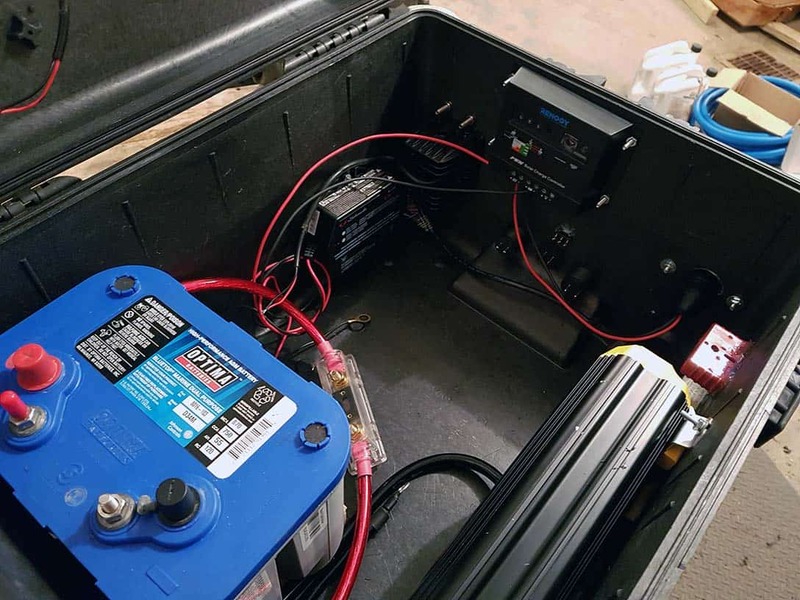 The 350A quick connector is optional, but it will allow us to easily use the battery of our solar generator with jumper cables, 12V recovery winches, or to daisy chain additional batteries / units if you need to put together an even larger system. 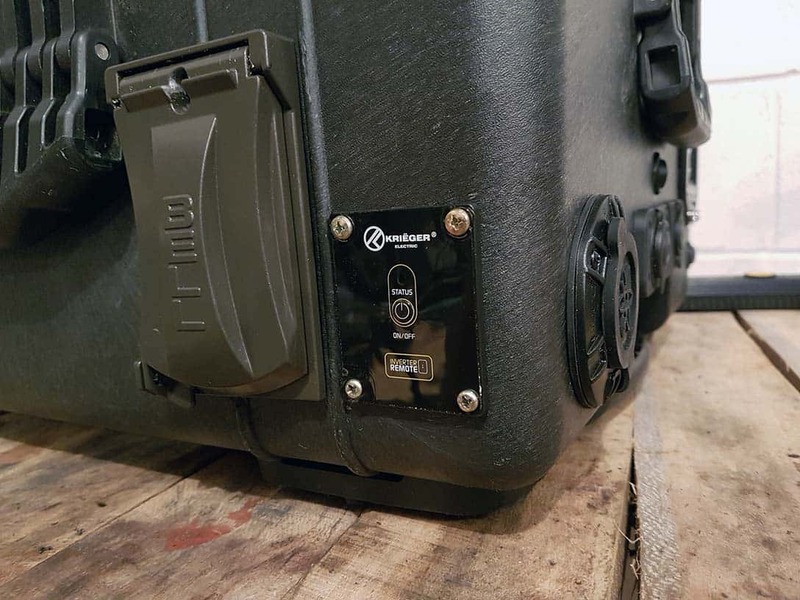 The 350A quick connector does not have a mounting flange, so trace its outline very carefully onto the pelican case. Also check to make sure the placement will not interfere with the cover of the weatherproof AC outlet. When cutting, error on the small side, and keep test-fitting until it just barely fits. This is important not only for the appearance of the unit, but also to allow us to make this connection sturdy. 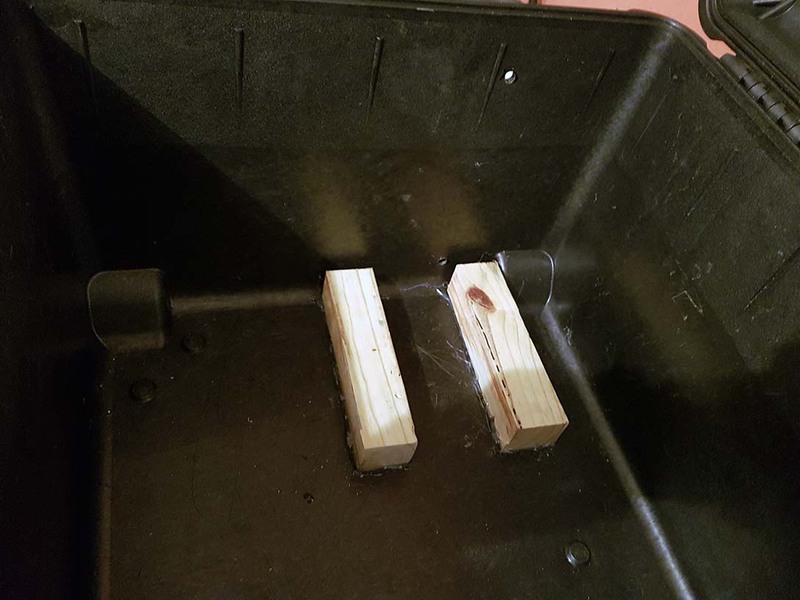 Once you have the right fit, carefully apply the silicone RTV around the edges of the connector, near the last rib in the plastic right before the rubber boot. Then push the connector into place. 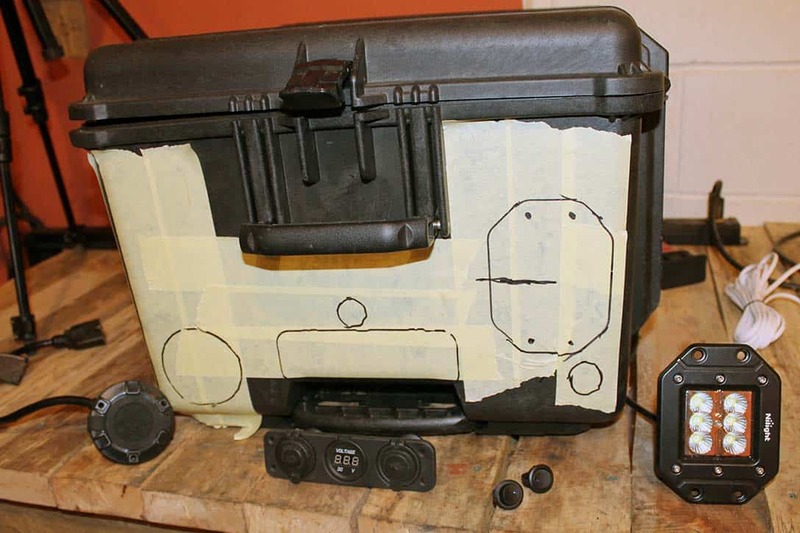 Using the hot glue gun, securely glue the entire perimeter of the connector from inside the case. Then smooth the RTV seam on the outside of the case for a nice appearance and to ensure a water-tight fit. We still need to mount the second LED light, which I placed on the lid surface of the solar generator. 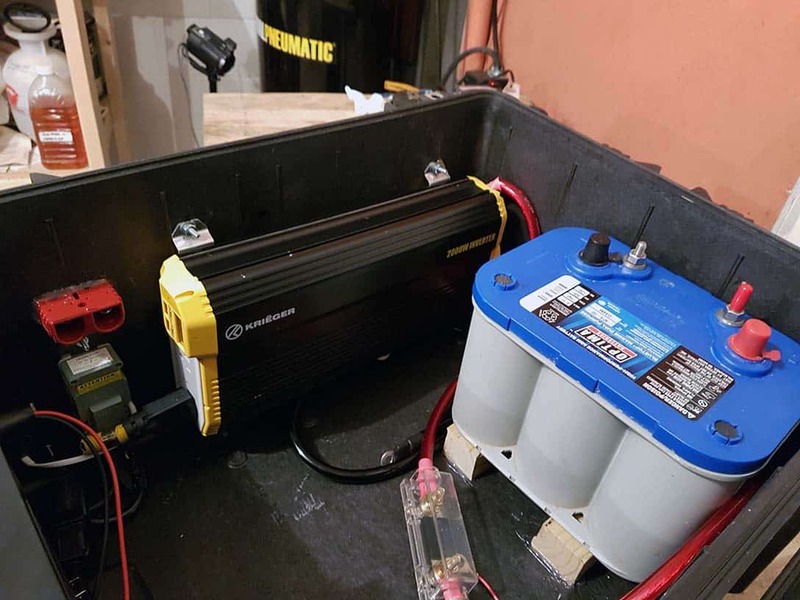 The procedure is the same as we used for the first one, but I recommend waiting until we have mounted all the major interior components, so that we can ensure its placement doesn’t interfere on the inside with the battery or inverter. Now that we can see where all of the exterior components are placed, we can work out the location for the interior components. Since the Optima Deep Cycle battery is by far the heaviest component, I placed it in the corner closest to the case wheels. This will make rolling the case around easier. 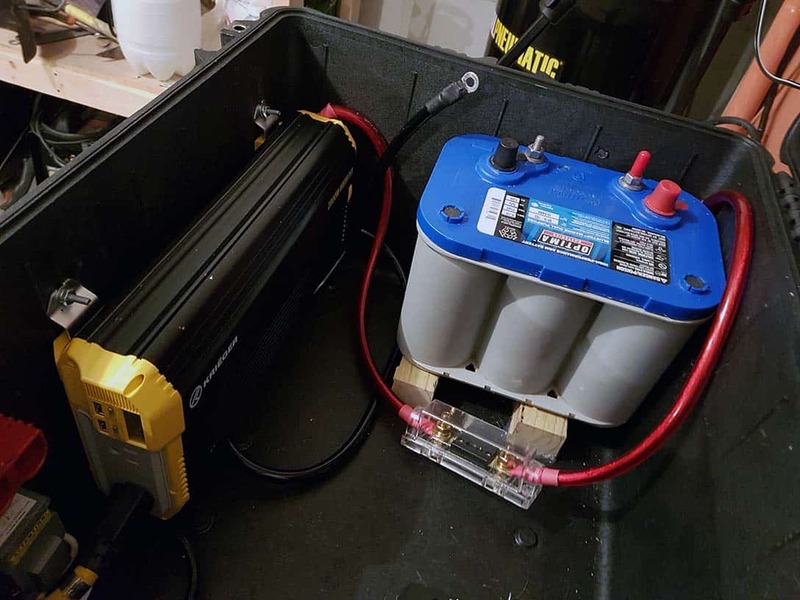 I pushed the battery to the back edge, and mounted the inverter to the front edge, so the overall weight in the case is fairly balanced. 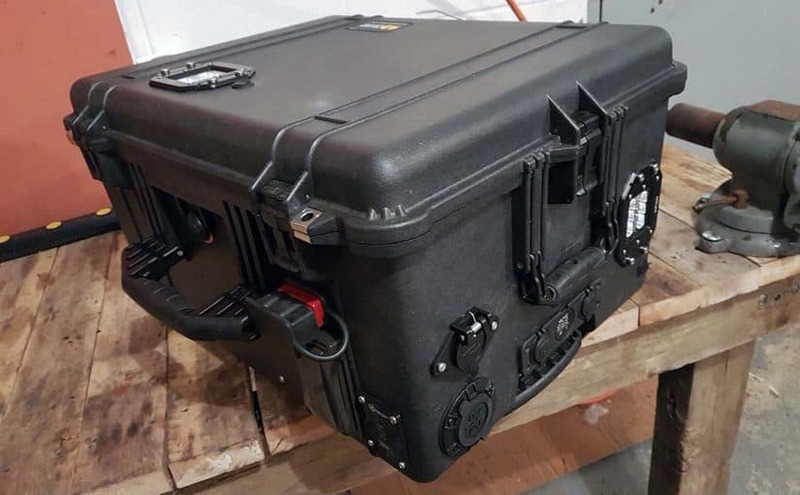 The Optima Deep Cycle battery can be oriented in any direction, but we want to make sure it is well supported in the two directions the Pelican case is likely to be used. Laying flat so that the lid opens upwards, and upright when rolling on the wheels. The battery mount will pull it tightly to the one side, so we just need to add some support for the bottom below the battery. The case has a protrusion for each wheel that prevents us from mounting the battery tight against both surfaces. I fixed this issue with a short scrap of 2×4 lumber. I cut the 2×4 down the middle to make two 2×2 pieces. These were the right height to lift the battery just past the wheel protrusion in the corner. I used hot glue to hold the 2×2 pieces in place. Once the battery is positioned in its final place, we mark and drill the two holes (one above the the battery, and one below) for the battery mount bolts. Go ahead and test fit the battery mount, but it will be easier to mount everything else if you take the battery back out until we are finished. Position the 2000 watt AC inverter so that its outlets are near the GFCI weatherproof outlet, and the 12V power cables are situated near the battery. 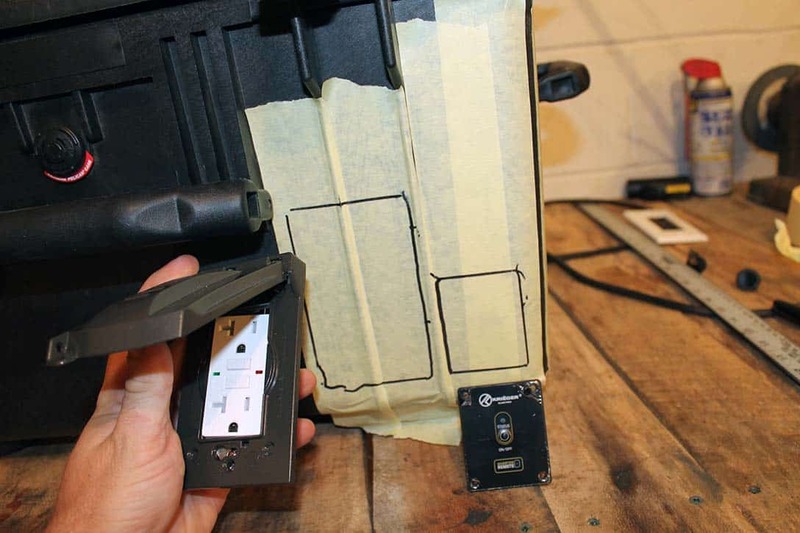 Tip: Connect both the power cables and the remote signal cable before installing the inverter. The negative cable can be rotated 90 degrees so that it points more towards the battery and reduce cable bind in the bottom of the case. Red cable to the + lug, Black cable to the – lug. Tighten the connections snug, but don’t over-tighten to the point you might break the connector lugs! Once the connections are wired, mark the bottom holes for the inverter first, and then drill them out. We will be using the #10-24 machine bolts, with washers, spring washers, and nuts for the mounting hardware. 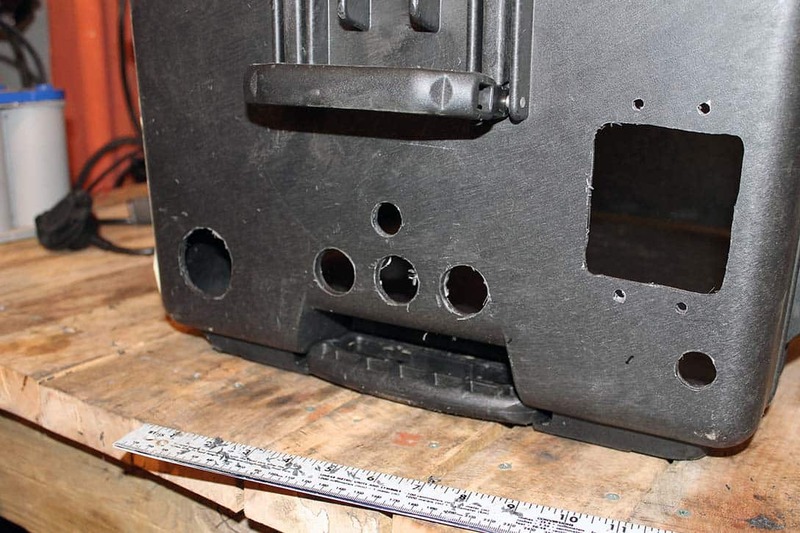 After the two bottom holes are drilled, insert two bolts and rest the inverter tabs onto them to mark the correct hole placement for the top two bolts. Once those are drilled, thread all four bolts, with a washer, spring washer, and nut and tighten them snug. Go ahead and plug the pigtail cord from our GFCI outlet into one of the inverter outlets. 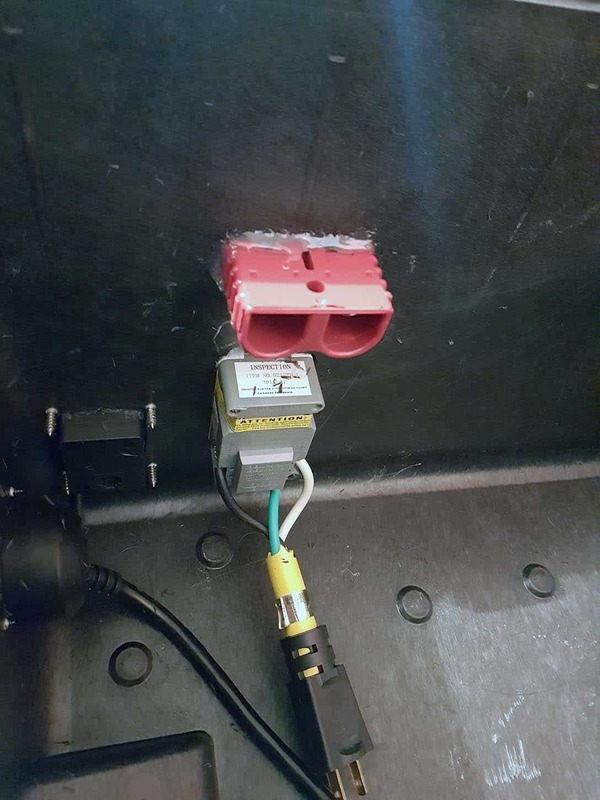 You can also connect the other end of the inverter remote control cable into the back of the remote switch panel. We are almost there! I positioned the AC battery tender / maintainer on the back wall near the LED light. It requires two bolts, which I again used the #10-24 hardware for. 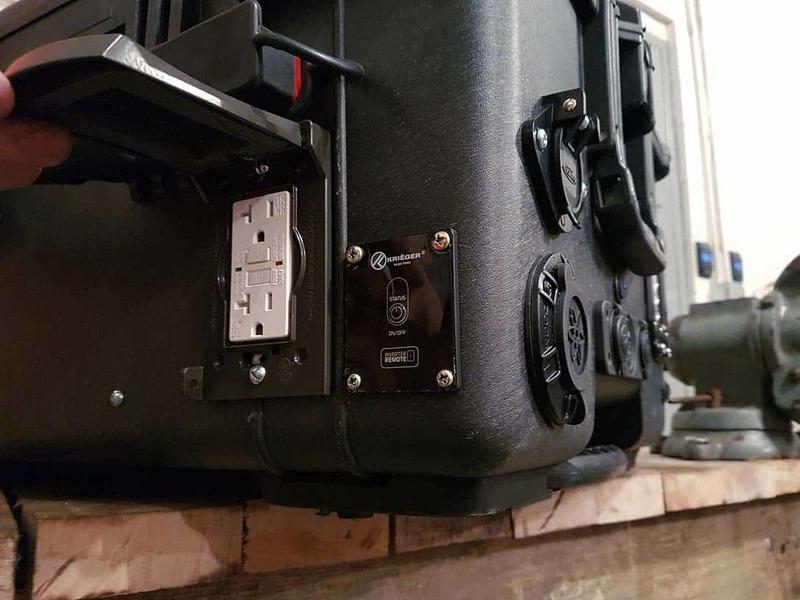 After it is mounted, you can connect the power cord to the female extension for the water proof AC cord socket we installed earlier on the outside of the pelican case. I installed the Renogy 30A solar charge above the triple function 12V panel and its power switch. It is also mounted with the #10-24 machine screws. Before mounting it in place, it is easier to connect the wires now. The connections are made by opening the gates with a small flat blade screwdriver. 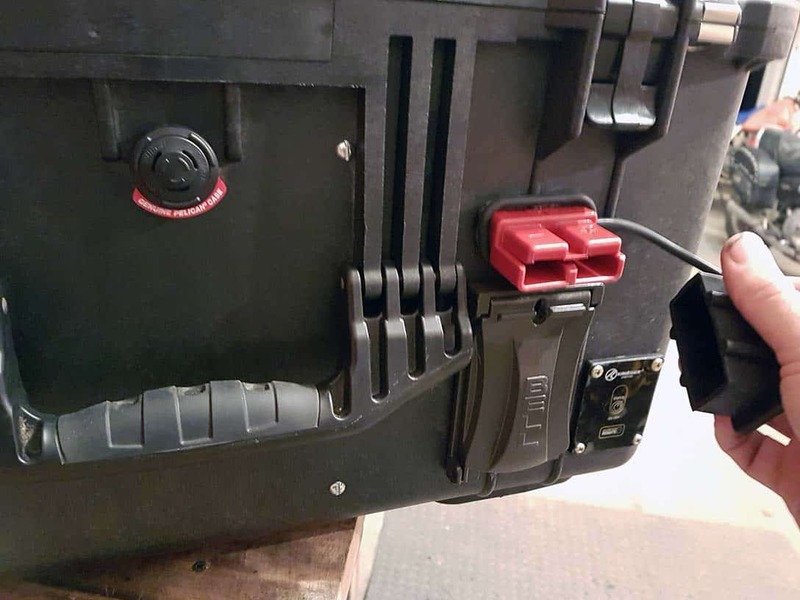 The red and black wires from our 6 pin solar panel quick connector will go to the connection on the charge controller with the solar panel icon. Red wire to the +, black wire to the -. Once each wire is inside the gate, use the flat blade screwdriver to tighten the gate until it is snug. We will also add another pair of 14 gauge black and red wires to the connection labeled with a battery icon. These wires should have a couple feet of length so we can route them nicely to the fuse block when finalizing the wiring in the next step. Again, red to +, black to -. Nice clean ergonomics. Really like the port to daisy chain additional batteries. Question? I’m unfamiliar with invertors’ do they put off any heat that might be a problem inside the box? Overall, I am impressed. Now I have to catch up! Yes, the inverters do generate some heat. The higher the load, the more heat they will generate. This particular inverter is designed for high loads and is often mounted in toolboxes on work trucks. It is also self protected so that if it gets too hot, it is designed to automatically shut down before it is damaged. 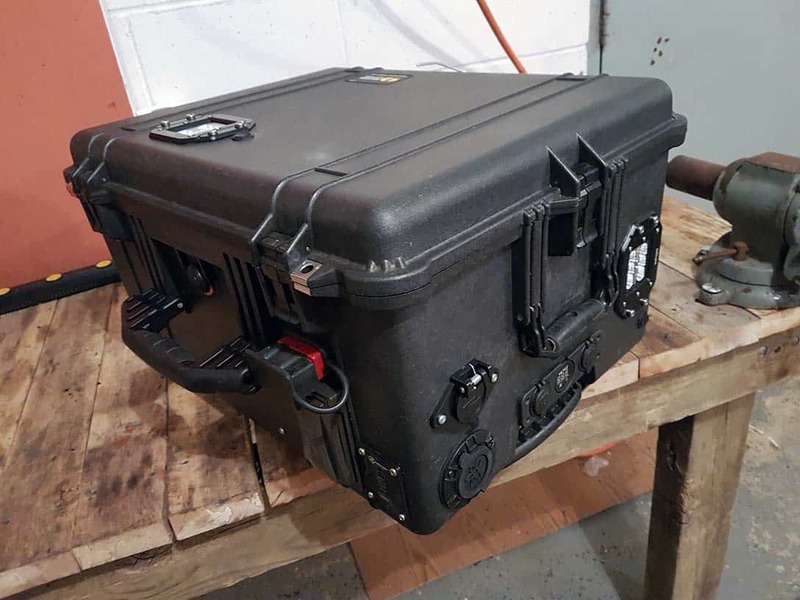 I designed the enclosure for weather-tight conditions, so I didn’t want to add large any external air vents to the pelican case. Some units have them, and while they would help cool the inverter, in many weather conditions they can also allow water to be sucked into the inverter – something that would result in damage. 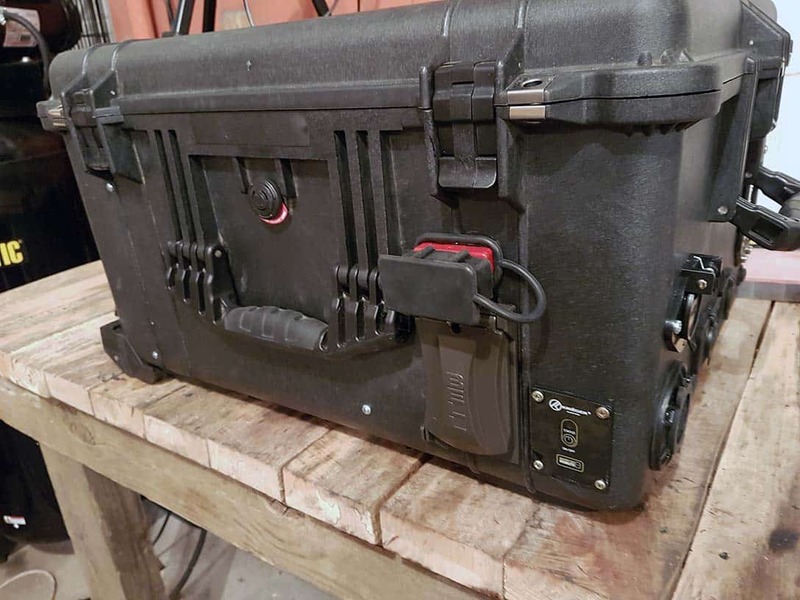 The case is fairly large, similar to a truck toolbox, so for most work loads I don’t expect the inverter will have much trouble cooling itself. For very heavy workloads we would always still have the option to just open the lid of the case, which would provide fresh air to circulate to the inverters internal fan. Updated the post to add the video. Nice write up. Very clean. When are you going to post part 4? One question- Have you thought about a little bigger battery set up? 55 ah isn’t much. Thanks for your hard work. Thanks Patric! I just posted part 4. I am thinking for this one I am going to keep the extra space in the case for storage of some additional accessories such as jumper cables, etc. Plus it will have keep the weight manageable. The unit is pretty heavy as it is. 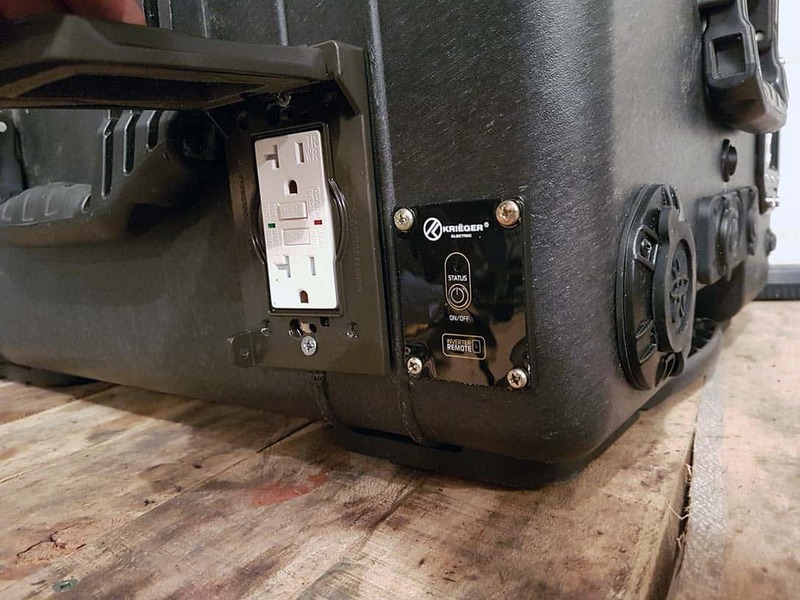 We do have a large current quick connector on the side of the case that we can use to connect in additional batteries if desired. I think this will give the unit more flexibility, allowing us to keep the weight down for portability while plugging in larger battery banks when needed. Thanks for all the great feedback guys! Having a hard time finding the 120 v AC charging port anywhere. Suggestions? Hmm, looks like Amazon no longer lists the one I used. I see they do have a couple other brands that look similar, but from reading reviews I am hesitant to recommend any of them. Seems those either don’t come with the male plug / pigtail on the back, or people say they don’t have long enough conductors to make a good connection. Here is the same one I used, but from NewEgg instead. I have purchased from NewEgg before as well, and they were fast with good service. 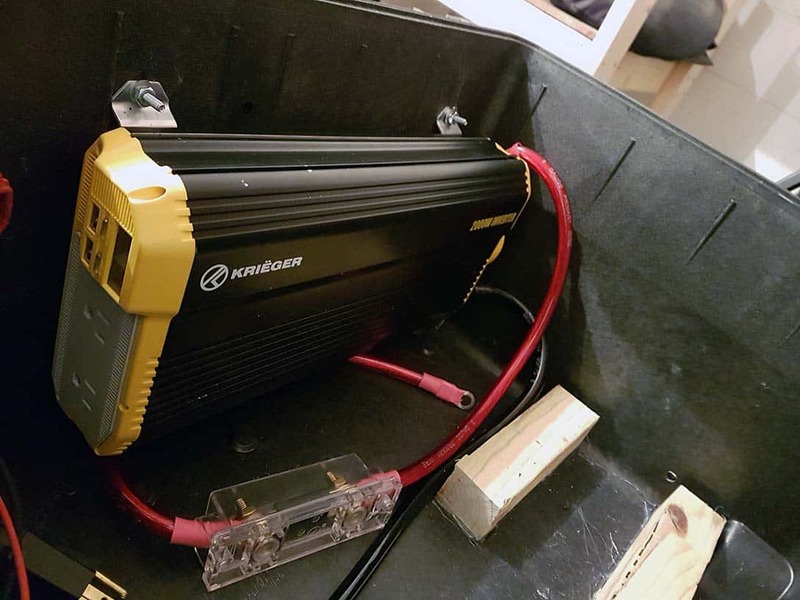 Newbie in prepping and saw your Video on YT, I am an Idiot when it comes to Electical Stuff but my next project is going to a Solar Generator DIY style. So I like yours , not really sure why but it looks upgradeble to me. So how many Panels could I hook up to this set up? 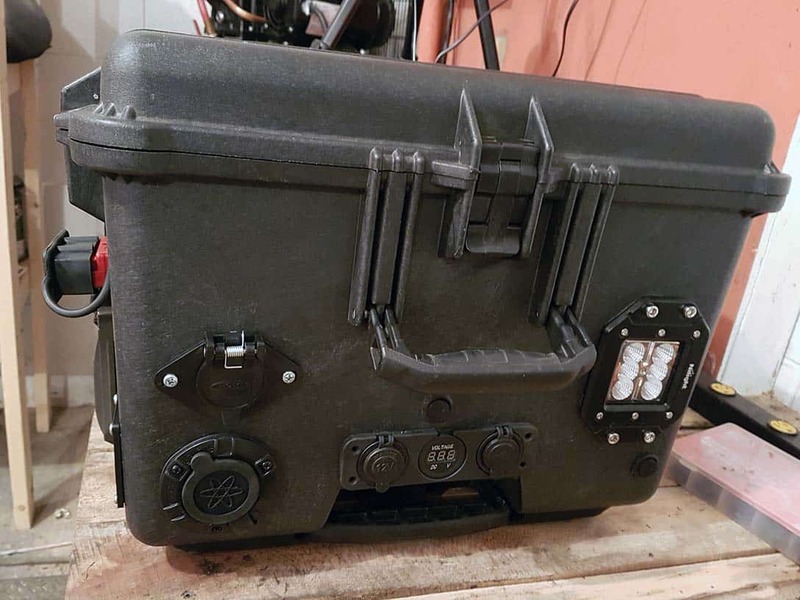 It is for my Bug out Local so I will not be moving it, so no Plastic case if anything I would put it in an Farraday Case to protect it from Solarflares etc.. This components need protecting they would be useless in an event like that? Sorry to many Questions, last one. Carbatterys would work or not ? Any suggestions ? Thanks for answering any of my Question. Choosing what food to stock up was a lot easier,lol. The number of panels you can use is limited by the solar charger. The solar charger I use in this build can supply up to 30A of charge current. The manufacturer recommends not exceeding 80% of this, which is 24A. On the back of the panels there should be a listing of specs, and the panel I used in this build lists Short Circuit Current as 5.75A. That is the absolute max the panel could provide in 100% ideal sunlight, with the max load possible on the panel. 24A / 5.75A = 4.2 panels, meaning that up to 4 of these 100 watt panels could be used in a 12V setup, with all four panels wired in parallel (all the + tied together, all the – tied together). Automotive (12V) batteries are fine! This charge controller will detect battery type automatically, and the inverters are often installed on work trucks, etc. I would think a Farraday enclosure would help against solar flares and EMP, but I’m not an expert on that, nor do I have any direct experience with that. Thank you for this amazing presentation. I am following the build step by step. Eventually I will get more panels and batteries that will remain stationary and i can take the portable unit to use on the fly. I chose all of the free shipping options so I hope I get all 30 of the parts (listed in Part 1) sometime in March 17′ . I will stay in touch and let you know how everything goes. The one thing I see that is not on the list is the 12 Gauge 3 way that you used for the GFI Outlet. Thanks, Dale. i have ordered almost everything off of your parts list for my project. However, you have listed a PowerMania AC Plug Port, but what I received from Amazon was not what you used. Re-watching the video, it appears that you are using a NCOC GCP1 Plug Port (or something similar) that comes with the short extension cord attached. The Power Mania port is just a “thru hull connection” that you have to put your own cord in. I thought I was ready to start installing, now I have to wait for a different plug. I enjoyed your videos but this is the second item I’ve come across that is different than what you are using. I am sorry for the frustration. The Noko Genius plug I used became unavailable. I had several people were asking for an alternate component to use instead in the comments, so I found the thru-hull version to use instead. There is no way to edit a YouTube video with updated info, other than the comments or to replace the video. I am doing my best to keep the parts list as close to what I uses as possible, but as items become unavailable, I have to list alternates. Mark, I ordered the NCOC GCP1 plug and it looks identical to the one you used and it arrived a few days after I ordered it. I have a question about the solar plug connections. I want to make a short extension cord that would go from where the cord enters my building to the plug in the box. If I wire my extension cord the same as I did with the box, it should work shouldn’t it? I would probably just put the jumpers on at the box though, they should be needed at the wall connection should they? I tested the electric plug in my box and ran my PC pancake air compressor for a while just fine. Thank you for all the help and keeping us posted on your updates/upgrades. Thanks Bob, I will add that back to the parts list. As long as the positive lead from the panel is ultimately connected to the positive input terminal at the charge controller, and same for the negative lead it should work. The longer the wire, and the number of connections you use will reduce efficiency some as the voltage drop between the panel and charge controller will increase. You can combat this some by using thicker gauge wire and good solid connections. I decided on the 12 awg extension cord because it was a good compromise between wire thickness, cost, and convenience due to the internal wires being bundled together, and easily coiled for portability. what is the work around for using a battery in a air tight case. Even AGM say not install in a airtight container. Hey Mark, are all of these parts compatible with a 500W solar input instead of 100W? I’m currently in the process of constructing a completely self sufficient camper/home that runs on propane and solar. I intend on having 2 250W solar panels for my energy needs. Would these parts and setup work the same?